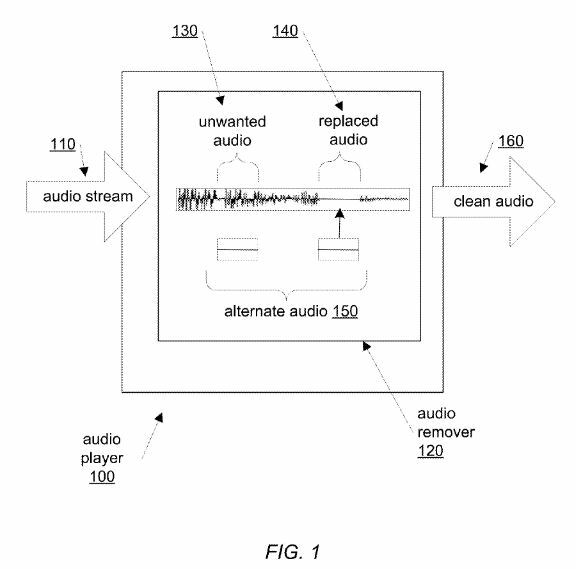 I read about a recently-published patent application from Apple that will allow an audio device (presumably an i-Device) to “self-censor” explicit content. The application is titled “Management, Replacement and Removal of Explicit Lyrics during Audio Playback,” and you can read the application HERE. Unwanted audio, such as explicit language, may be removed during audio playback. An audio player may identify and remove unwanted audio while playing an audio stream. Unwanted audio may be replaced with alternate audio, such as non-explicit lyrics, a “beep”, or silence. Metadata may be used to describe the location of unwanted audio within an audio stream to enable the removal or replacement of the unwanted audio with alternate audio. An audio player may switch between clean and explicit versions of a recording based on the locations described in the metadata. The metadata, as well as both the clean and explicit versions of the audio data, may be part of a single audio file, or the metadata may be separate from the audio data. Additionally, real-time recognition analysis may be used to identify unwanted audio during audio playback. The court held that public distribution of edited versions of plaintiffs’ films for the purpose of eliminating objectionable content did not constitute fair use. It ruled that the edited film versions were not transformative because they added nothing new to the originals. It further held that the “amount and substantiality” factor weighed against a finding of fair use because the movies were copied in their entirety for non-transformative use. Regarding the fourth factor, plaintiffs claimed that there was no adverse effect on the market for the films because they maintained a one-to-one ratio between original and edited films, and that but for their editing, the defendants would not have sold those particular original copies. The court, however, stated that this argument ignored the defendants’ “right to control the content of the copyrighted work,” and further remarked that “[w]hether these films should be edited in a manner that would make them acceptable to more of the public … is a question of what audience the copyright owner wants to reach.” The court also found that editing the versions as a form of comment or criticism was a public policy argument that was not appropriately raised in the copyright context. But, Apple’s technology might not be making a new copy of a song to then censor, rather, it’s merely bleeping or silencing-out a portion, so there is a decent argument that this will not be a copyright issue. “Moral rights,” which can protect the integrity of (or cursing in) a work, are generally not recognized in the U.S., so the mere act of censoring a work isn’t necessarily copyright infringement. But, Apple’s technology is similar to the facts of a 1970’s case wherein ABC was sued by the people behind the Monty Python program based on ABC making edits to Monty Python re-broadcasts. There, the court found that ABC might actually be violating the Lanham Act, which forms federal trademark and unfair competition law. By editing the episodes, ABC misrepresented the source of the episodes. That is, by screwing around with the way that Monty Python’s writers intended the episodes to look, ABC damaged Monty Python because viewers might think that the edited, “less good,” episodes originated with Monty Python. This is similar to a line of cases where Rolex has successfully sued after-market jewelers who add “bling” to Rolex watches. Rolex argues that they would never add a dial full of diamonds or other tacky embellishments, and when jewelers do so, they damage the Rolex brand because consumers might think that Rolex was the source of the tackiness. In sum, Apple may not even bring this technology to market, and even if they do, I would imagine that for artists to have their music on iTunes (the patent anticipates use in streaming environment), they will have to agree to allow the use of the technology. But at the end of the day, this may not be legally actionable anyway. Artists typically create a “clean” mix of a song. I wonder if Tipper Gore would have approved? Apple’s full application may be downloaded HERE.